It means initiating hajj and ‘umrah by assuming ihram from the designated miqat for a pilgrim’s country. This means not going beyond the miqat site for his country without entering ihram. It is permissible for a pilgrim to assume ihram from his country, the airport, the seaport, on board a plane, on board a ship, or from the miqat site itself. If a pilgrim passes the miqat designated for his country without entering ihram, he must offer a sacrificial animal in expiation. This sacrifice is not obligatory if he returns to the miqat to don ihram (before performing the rites). After leaving al-Mash’ar al-Haram, a pilgrim heads to Mina to stone Jamarat al-‘Aqaba al-Kubra after the sun is shining brightly in the sky. Stoning is one of the required rites of hajj. For someone who has previously stood at ‘Arafat, the time for stoning begins from midnight of the eve of yawm an-nahr (according to Shafi’i and Hanbali scholars) and from dawn of yawm an-nahr (according to Hanafi and Maliki scholars). According to some scholars, its time extends to the last of the days of tashriq based on the fact that all the days of Mina are as one. Some scholars have maintained that the time for stoning is divided into the time of performance (which extends until sunset of yawn an-nahr) and make up time (which begins from sunset of yawn an-nahr until the last of the days of tashriq). The recommended time for stoning begins from sunrise until midday of yawm an-nahr (10th Dhul-Hijjah). The pebbles picked for stoning must be small and bean-sized, neither too small nor too big. When stoning Jamarat al-‘Aqaba, it is recommended for a pilgrim to have Mecca to his left and Mina to his right, contrary to the stoning performed on the days of tashriq when it is recommended for him to face the qiblah. It is obligatory to throw seven pebbles at each stoning site and to throw the pebbles one by one. The throwing place is the structure itself and the surrounding area i.e. it is necessary that the pebbles fall inside the specified area; a pebble that is thrown further than the throwing site or one that falls before it does not count. The pilgrim must not use other than small pebbles. He must avoid following the example of those who use their slippers to bat the pebbles and other similar acts. As soon as a pilgrim arrives at the stoning site, it is desirable to throw the pebbles picked up from Muzdalifa although he may pick them from anywhere and not necessarily from Muzdalifa only. It is desirable to make takbir every time he throws a pebble at Jamarat al-‘Aqaba and on the rest of the days of stoning. It is recommended to throw the seven stones consecutively without any form of interruption. It is obligatory for a pilgrim on hajj tamattu’ or qiran to sacrifice an animal after stoning Jamarat al-‘Aqaba and this is merely recommended for a pilgrim on hajj ifrad. After slaughtering his hady, a pilgrim shaves or shortens his hair. It is recommended for males to shave their hair while it is obligatory for women to merely shorten theirs. This is because shaving in their case is considered mutilation. It is recommended for a pilgrim to slaughter and shave his hair before midday, though a pilgrim may delay slaughtering until the last day of tashriq which is the most correct opinion in the Shafi’i school and other schools of jurisprudence. There is no specific time to cutting or shortening the hair as there is likewise no particular place where it may be performed. It is desirable to stone Jamarat al-‘Aqaba before sacrificing, shortening or shaving the hair and making tawaf al-ifada. It is likewise recommended to sacrifice before shaving and to sacrifice and shave the hair before making tawaf al-ifada. There is no objection to inverting the order of these rites. After a pilgrim finishes the rites of yawm an-nahr, he must stone the stoning sites during the days of tashriq. It is obligatory to stone the three stoning sites: the first, the middle and Jamarat al-‘Aqaba. The time for stoning begins from midday until sunset and it is permissible to stone before midday due to crowding. On the days of tashriq, it is permissible to stone from midnight of the first day of tashriq (11th Dhul-Hijjah), just as it is permissible to postpone all the stoning of the days of tashriq till the last of its days. If a pilgrim delays stoning until after sunset of the third day of tashriq (13th Dhul-Hijjah), he must slaughter in expiation. According to the opinion of some Shafi’i scholars, it is permissible to stone a day ahead of its time. A pilgrim is to stone by throwing seven pebbles (at each of the three stoning sites) picked up from any place. It is desirable to face the qiblah when stoning on the days of tashriq. Neglecting to stone necessitates sacrificing a hady in expiation. According to the majority of scholars, it is a condition to stone in the following sequence: the first stoning site, close to the mosque at Mina; then the middle; and finally Jamarat al-‘Aqaba. It is not obligatory to follow this sequence according to Hanafi scholars. Based on this opinion, the stoning of a pilgrim who does not follow this sequence is valid and he is not obliged to sacrifice an animal in expiation. After stoning the first two sites, it is desirable to make du’a` and praise God the Almighty while facing the Ka’bah. It is recommended to go to and from each stoning site on foot although it is permissible to use transport. A pilgrim must avoid the crowding and jostling that occurs at the stoning sites. It is recommended to stone after midday i.e. before dhuhr prayer without delay. It is also recommended for a pilgrim who does not wish to leave early to go to Muhassab1 after stoning on the third day of tashriq (13th Dhul-Hijjah) to pray dhuhr, ‘asr, maghrib and ‘isha. Afterwards, he is to go to Mecca to make tawaf al-wada’. All of the above are recommended when a pilgrim’s safety is guaranteed and if there is no crowding at the stoning sites. But they are not recommended if they will lead to harm. The total number of pebbles stoned by a pilgrim who wishes to leave early is forty nine: he throws seven on yawm an-nahr, twenty one on the first and twenty one on the second day of stoning. This is the minimum number. The total number of pebbles stoned by a pilgrim who does not wish to leave early is seventy: he stones Jamarat al-‘Aqaba al-Kubra with seven pebbles, throws twenty one on the first day of stoning, and the same number on each of the second and third days. This is the maximum number. It is permissible for a pilgrim who is unable to stone for himself due to old age, an illness, crowding or the like to commission another to stone on his behalf. It is not a condition that the one commissioned be a pilgrim and it is permissible to commission him to throw on his behalf for a fee. But if the person commissioned is a pilgrim, he must do his own stoning first and then stone on behalf of the pilgrim who commissioned him. In the Shafi’i school, it is permissible for a pilgrim to do his own stoning in one site and then stone for the person who commissioned him before moving on to another stoning site. It is permissible for a pilgrim to commission another to stone all or some of the three stoning sites on his behalf. Tawaf al-wada’ is obligatory upon a pilgrim who leaves Mecca after performing all the rites for any of the miqats, or for a place close or further than them. 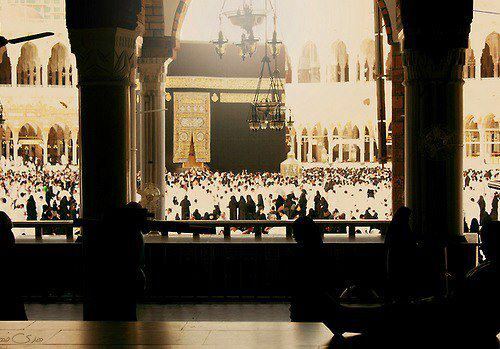 A pilgrim who neglects to perform tawaf al-wada’ is obliged to sacrifice a hady in expiation. Some scholars have maintained that tawaf al-wada’ is a sunnah and therefore its omission does not necessitate slaughtering in expiation. Tawaf al-wada’ is not obligatory upon a woman in a state of menstruation and she does not have to wait until she is pure to perform it; it is permissible for her to omit it and is not obliged to sacrifice in expiation. This is the opinion of all scholars. In this manner the rites of hajj are complete. 1 A place at Mecca (also called al-Abtah), so called due to the gravel carried into Mecca valley by torrents. Currently, it is an inhabited area lying between the royal palace and al-Ma’la cemetery on al-Abtah Street.